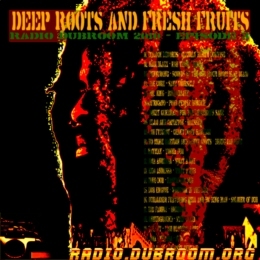 WWW, June 2010 - The third episode of Radio Dubroom in this year of 2010 has two segments: we start with some Jamaican Roots Reggae and then turn to Poland, France, Italy and Spain for some very deep Dubwise. Jamaican Roots Reggae is, unlike some people claim or think, not dead at all. In fact there’s some pretty strong material coming out, increasingly during the last years. The first nine titles are all reserved for a musical illustration with this statement. Most tracks were reviewed in mp3.dubroom.org. No More Babylon’s crucial Discomix with the crucial vocals of Kenny Knots marks the transition to the second segment of the show, which contains a very interesting selection of High Quality Deep DUB from the Online (DUB) Reggae Artist community. What to say about Italy’s Moa Anbessa? Crucial stuff from the producers who work with the UK based Zion Train collective. Deep electronical Roots DUB from Dub Engine, Dubalizer and Big Family show that there is indeed Roots in electronic music as it is always the people who make the music. The final track of the podcast, from the Spanish based band Hot Drop, closes of what was a selection of Deep Roots and Dub, deep as in: conscious lyrics, fat bass: authentic Reggae music in two of it’s many forms!